Interested in providing your wealth of knowledge and skills to businesses within the virtual space? One of the best ways to acquire more professional freedom, is by working as a virtual assistant. The scariest part about becoming a virtual assistant is knowing where to begin. Our in-depth guide includes professional insider advice which will allow you to make a smooth, stress – free transition into your new role as a virtual assistant. When changing careers, it is important to research the industry before you commit yourself to it entirely. Having experience as an in-house assistant will give you the competitive advantage you need to enter the virtual space. However, your success as a virtual assistant comes down to analysing your competitors and discovering the best way to present yourself. Whether you know multiple languages, have a background in social media or are experienced in SEO, your current skill set will give you a good idea of the kind of services you want to provide to clients, as well as the number of hours you wish to work. There is nothing more advantageous than being a virtual assistant since your skills dictate your target audience, as well as the way in which you wish to work with these businesses or individuals. One of the best advantages of being a freelance virtual assistant is the direction you want to take. Thinking about what industries excite you is the first step towards developing a skill set that businesses and individuals within that industry can benefit from. 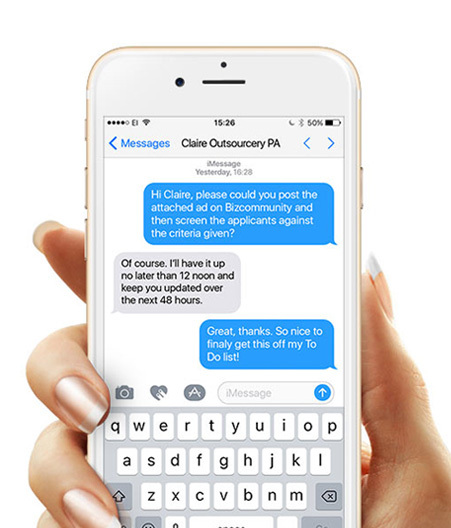 Making the move from an in-house assisant to a virtual assistant provides you with the opportunity to request recommendations and referrals from previous colleagues as well as employers. Networking platforms like LinkedIn allow you to reach out to potential clients from your personal profile by making connections. Websites remain your digital portfolio; invest in one so that you can promote your services to the best of your ability while potentially offering visitors a free trial, so they can gage what you are capable of. Building your initial client base is difficult, but sites such as Upwork make this highly effective even though they take a commission on your earnings. If beginning your journey as a freelance virtual assistant, then starting off with a virtual services company, such as Outsourcery might be the right move for you. Our virtual PA’s undergo extensive expert training and are paired with clients accordingly so that the best technical support can be provided. Although there is less freedom, Outsourcery will allow for enough flexibility so that you can establish yourself as a trusted virtual assistant who is constantly supplied with work. The key to delivering expectations with Outsourcery comes down to flexibility. A great virtual assistant is able to predict what their client’s future requirements might be, and how to adapt their skill set in order to deliver a service that communicates the highest level of dedication. Furthermore, transparency regarding what specialised skills you cannot provide for a client allows you to go the extra mile in referring them to the next best option to meet their specific needs. “My virtual assitant Emma is amazing, while Emma works remotely and not in my London office, it’s like she is always here. She has become a critical member of my team and indeed my personal life too. When onboarding your clients, they will specify their preferred mode of communication. However, offering multiple suggestions detailing better alternatives is good for clients who are working with a virtual assistant for the first time. Constant communication is key for your client, as well as your own happiness. We encourage a virtual meeting every week via FaceTime or Skype. The importance of this weekly meeting lies in the intimacy of human connection, and identifying what different facial expressions communicate your clients various emotions. You can use email, text, or Whatsapp to communicate with your clients on a daily basis, but it all comes down to their preferred method of contact, and incorporating this into your daily routine. Trello – (com) Manage your tasks by creating boards which act as a means for organising current work, monitoring progress, and inviting others to contribute to your projects. Setting up checklists, deadlines, workflows, and discussion boards unique to your client’s objectives are easy. Furthermore, you can easily attach files, images and videos for your client to review. Todoist – (com) Assign multiple tasks, as well as subtasks to yourself with the use of filters and categories that enhance productivity. Software such as Google Drive and Cloud Magic can be easily integrated so that your content is readily available to you within Todoist. Harvest – (com) Recognised as one of the most effective time tracking software’s used by many freelancers, Harvest allows you to start and stop timers, as well manual timesheets so that you can stipulate how time should be recorded. The ability to add notes gives both you and your client insight into exactly what work was done, how many hours were spent on a task, and is a great way to track progress for picking up work the following day. PlannerPro – (apple.com) This has become a staple in the Outsourcery office because of its effectiveness. You can organise your day into a calendar that is easy to read, which also allows you to set and track deadlines. You can either use the free plan or the ad-free pro version for a small annual fee. Wunderlist – (com) Imagine Todoist, but for the creative minded. Wunderlist allows you to customise your to – do lists with a selection of background images that suite your preferences. Furthermore, creating lists, adding deadlines, as well as saving webpages and links, has never been easier. The nature of being a virtual assistant requires you to contact clients well in advanced, while offering solutions for covering your work. This is where your incredible ability to network comes in handy, providing you with an alternative virtual assistant who can help your client while you are on holiday. It is your responsibility to brief your replacement with the all the essential information required to meet your clients demands. What makes you unique? Why are your services better than your competitors? How can you use creativity to position yourself as one of the best virtual assistants to work with? These are the questions you need to ask yourself when building a reputable brand. You will never have one client that is the same as the next. Be open to changing how you deliver your special skills as well as the ways you work in order to meet a specific clients needs. This is where you can really stand out from the crowd by providing a bespoke service unique to every client. Adopting the objectives of your client as if they are your own will see you exceeding your client’s expectations. If a client recognises your enthusiasm and commitment towards the work they have requested of you, they are more likely to continue working with you, upscale, or refer you to someone who might benefit from your services. This is why going the extra mile is always worth the effort. IF YOU’RE CHOSEN, YOU’RE VERY SPECIAL! Of 200 applicants declined, you had what it takes to be selected. Want to become a virtual assistant with us, search jobs now, we are always hiring great people.